We left 2 very difficult weeks at the Destination Eurovision, which finished the second semi-final as of last night and determined the 8 songs that will compete in the final. If you didn’t have the chance to watch the first semifinal first, you can watch a 4 minute summary video here. The first performance was performed by Naestro with the song “Le Braiser”. Although he had a strong vocal ability, if you ask me, it was quite an ordinary song because he had no different style. I didn’t think he would be in the first 4 on the rankings. And Naestro didn’t get into the top four. The main surprise of the night started with the performance of Florina’s “In The Shadow”. Florina, who was quite successful and was shown as a favorite in the charts, was extremely excited during her performance and showed several tonal shifts. But the stage performance and the emotion flow was above all I expected. The French juries would have thought the same way, so when the performances were over, they showed Florina among the four favorite pieces. With such an enchanting song, Florina received zero points from the jury and could not enter the top 4. The third performance of the night was Chimene Badi’s “La Haut”. It was expected to take place in the first 4 with a strong voice and a delightful song. Especially the colorful performance in a cube was really nice. Chimene was also a name that judges expected to be in the top 4. In line with our expectations, Chimene became the first 4. After Chimene’s performance, Battista Acquaviva took the stage with her ambitious song and performance. To be honest, Battista’s scene was really one of the best scenes. However, Battista’s song remained rather dull among her rivals. The scene was very similar to the “X My Heart” scene of Aisel, who represented Azerbaijan at Eurovision 2018. Unfortunately, Battista did not meet the expectations of her fans and she was not in the top 4. After Battista’s performance, Silvan Areg performed the song “Le Petit Nicolas” which I could not enjoy any musical feeling due to his cartoon-like performance. When you watch the performance, you get the feeling that Cartoon Network is opened. I didn’t think he would be in the first 4. Silvan, unfortunately, entered the top 4 and became one of the shocks of the night. I would find Battista, Florina and Naestro even more likely to enter the top 4 than Silvan. After this performance, Bilal Hassani, who is the number 1 in the lists and bets, performed with his song Roi. Bilal, one of the most talked-about names in this year’s Destination Eurovision, is quite assertive. His song is a powerful song, as you can tell from the lyrics mentioning “Rise Like A Phoenix” lightly. Bilal Hassani does not hide his Conchita Wurst admiration. He previously starred in The Voice, where he performed Rise Like a Phoenix. If you ask me, Bilal’s song is very strong and ambitious. 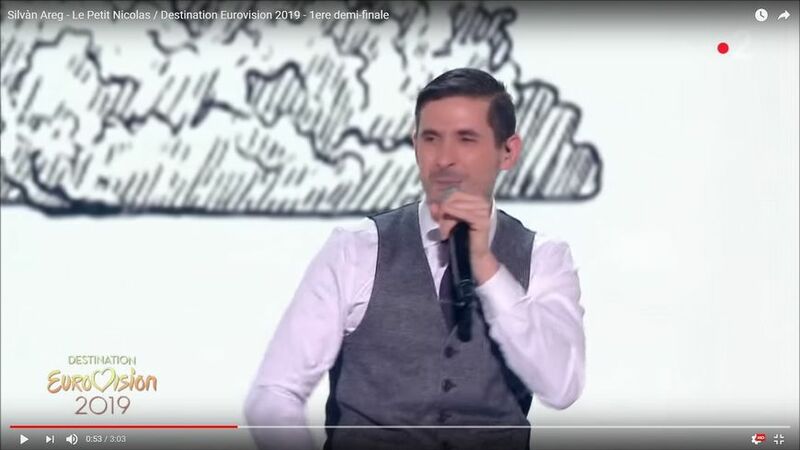 I think he is the name that will represent France at Eurovision 2019. But for such a powerful song, the stage performance is rather weak. Instead of the dancers in the back and a classic solo vocal, I wished he’d come out with more powerful choreography. Bilal, however, is an artist I’m most likely to have this year. He was ranked 1st in the first 4, collecting the highest score from the juries and the public. After Bilal’s cool performance, Aysat appeared on stage with her song “Comme Une Grande”. I think she couldn’t use the microphone very efficiently. I think she had a low voice during her performance. Also, She was hiding the weak points of her voice because she performed by dancing. So I didn’t think it was possible for her to get into the top 4. I think she deserved the 5th place. However, Aysat surprised me and took a place in the top 4. Right after Aysat, my other favorite Lautner appeared on the stage. Lautner sang the song “Jai pas le temps” with the support of Amir, the representative of Eurovision 2016. Obviously, I feel happy to see such young names in Eurovision. I think this song is a style I like to be pleasant and take part in Eurovision. Particularly I loved the part of the group members playing the violin. It was a song that I really wanted to be in the first 4 and they were almost in the top 4 with jury votes. However, after the public vote, they couldn’t take a part in the first 4, with 5 points difference. The last performance was Mazy’s song “OuLaLa”. Since it was extremely ordinary, it was estimated that it could not enter in the first 4. That’s what happened. But the point I want to underline is that Bilal is the name that gets the highest score from the jury and the public. We did not see such a successful score in the semi-final 2. The second semi-final started with Netta’s Toy performance. As soon as the performance was over, the protestors jumped into the scene and we saw the “Say No to Eurovision in Israel” writings. French television has destroyed this scene in a professional way, but you can reach our new here. These protests took place in front of Netta and Jon Ola Send. It has made me very worried about May 19, and I hope that nothing happens to us in Tel Aviv. With the protest shock after Netta’s performance, let’s get ready for a second shock. HOW CAN’T GABRIELLA TAKE A PART IN TOP 4? Can you look at the beauty of her performance and her violin playing? Everyone was sure that Gabriella would be in the top 4 – including the juries. So her place was definitely the second shock of the last night. After the performance of Gabriella, The Divaz performed with a classic Americano song piece called Respect. It was obvious that their voices were strong but I didn’t expect the first 4 for them, because they had no effect on me. They deserved 5th place for me, but they were surprisingly involved in the top 4. After The Divaz, Ugo appeared on the stage. Ugo is a young artist. I really want to see young names in Eurovision. That’s why Ugo managed to be my guilty pleasure, which I secretly backed. But since I found his volume control quite weak, I did not put him in the first 4. The judges surprised me a lot because he was in the top four in the jury vote, and he fell to 5th in a public vote. (Same fate as Lautner: /) But his song on Spotify is pretty good. Unfortunately the live performance is full detonate. Ugo missed 4th place with only 1 point difference. After Tracy, Emmanuel Moire created the main shock of the night with a song “La promesse”. If you have listened to the song as a radio edit, it comes as a quite ordinary French love song. But Emmanuel’s performance last night was the most successful performance of the night. The active use of the scene, the change of clothes and the beginning of the song were truly fascinating. Emmanuel, who was not the first one in my 4, managed to get into the first 4 after the stage show. As a result of the voting, the jury voted the second best place for Emmanuel, and the public voted the best place for Emmanuel. I want to underscore this, as Bilal was the biggest player in both categories, while Emmanuel unexpectedly took a share of the votes from Seemone. After Emmanuel, Noemie appeared on the stage with her song Ma petite famille. Noemie, who performed a rather boring song with her lumberjack shirt, could not enter the top 4 as expected. But I was amazed by the fact that the jury member of the Czech Republic, Mikolas Josef, gave “8 points” to this song. Seriously Mikolas? As a result of Mikolas’ vote, Tracy was defeated in the list. After Seemone, Doutson went on stage. The last shock of the night was Doutson’s getting into top 4. Doutson, who was the last in the bets, took 4th place unexpectedly. I don’t even like to share his song’s preview because I didn’t like the song. After Doutson, PhilipEllise appeared with her song Madame la paix. And as we expected, she couldn’t enter the top 4. The vote was surprising to us all. The jury votes and the public vote were really different, especially in this year’s semi-finals. My favorites were Gabriella, Seemone, Emmanuel, Tracy, but Seemone, Emmanuel, The Divaz, Doutson were top 4. For the entire vote that surprised us, you can click. My guess is that Bilal Hassani will win the final with song called Roi. I think the representative of France will be Bilal Hassani at Eurovision 2019. Seemone is the second name given the most chance. Bilal Hassani will be the winner of a possible Bilal-Seemone contest in the final. However, the fact that Emmanuel is in the final now. And he will decrease Bilal’s chances because he will divide the votes. In addition, the sharp differences between the jury and the public are very remarkable. With a score of 4-5 points Lautner lost the final chance. With 1 point difference, Ugo could not reach the final. If I were in the French channel management, I would change the voting system for the next years and turn the jury into a minor position. It seems like next week we’ll see a final full with surprises! #GoBilalHassaniGo! Eurovision: You Decide Katılımcıları Sızdı Mı? İspanya Bu Akşam Eurovision Şarkısını Seçiyor!